The GRI Standards are the world’s most widely used sustainability reporting standards: 80% of the world’s 250 largest companies use them to report. They identify their most important impacts and proceed by measuring, managing and changing. 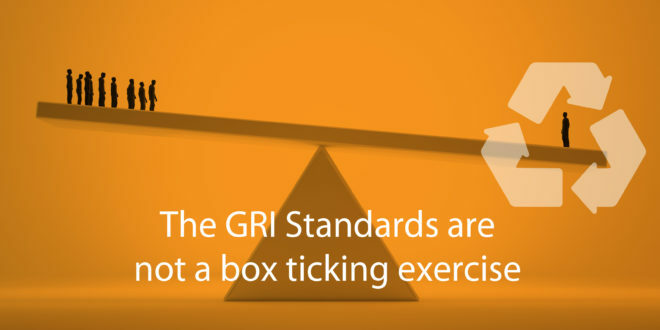 The GRI Standards are not a box ticking exercise: they can be used by any company, regardless of size, sector or location, not only to get a clearer picture of future risks and challenges, but also to identify and act on opportunities. Responsible sustainability reporting is like having your radar switched on. 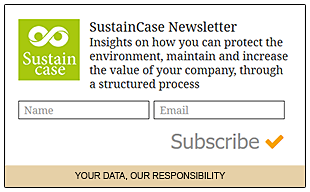 A key insight is that a growing number of companies, who are sustainability reporters (and responsible individuals), are overwhelmingly choosing sustainable products and services. Most importantly, sustainability reporters are choosing to do business with companies that tie in well with their sustainability efforts. Companies are choosing business partners for the long term that demonstrate that they benefit from the transition to the green economy and respond to climate, demographic, technological change, and political developments. Research by well-recognized institutions shows that sustainability is an emerging megatrend. In addition to supply chain pressure, regulators are forcing companies to disclose non-financial information (in the EU, all large companies are required to report). Moreover, companies who are reporting, in their effort to reduce their impacts even further, investigate and chose products and services that help them to do so. Consider Desso, which, by leasing carpets, is better able to ensure products are returned for recycling. By offering customers (e.g. hotel chains, governments, corporate offices, retail outlets, and healthcare) the option to lease rather than own carpets, Desso controls recycling and helps customers demonstrate, in their sustainability reports, how they manage to reduce even further their own impacts. Other carpet manufacturers who are not able to offer such solutions are doing so to their own detriment. How did Coca-Cola handle problems with its bottled water business in Japan? Real estate: a typical unit in Tokyo, which is home to 13 million people, is about 70 sq.m. As the ILOHAS bottle is so light, it can easily be twisted by hand into a thin, gnarly scrap of plastic, and take up significantly less room in recycling bins. Coca-Cola’s simple promotion message, “1. Choose 2. Drink 3. Twist 4. Recycle” went viral in Japan, with consumers posting videos on YouTube featuring them twisting. The product sales spiked by double digits in less than six months, along with a dramatic rise in recycling. I invite you to take action, identify your most important impacts, measure, manage, and change and become, with your positive contribution, part of a positive chain reaction that is changing our world.